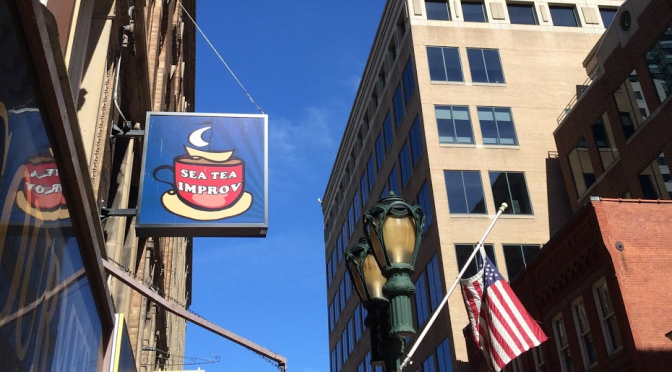 Our Studios are home to our classes, rehearsals, end-of-class shares, and other drop-in events for Sea Tea Improv and the CT improv community. Our main room is Studio 500, with its black stage wall with a curtained exit. This room has 19 folding chairs available, 2 bentwood cafe chairs & 4 wooden stools for the stage area, and a rolling desk chair. Soundproofing panels (dubbed our “guilt absorbers” by Will Hines) on the walls & ceiling focus the room’s acoustics. The walls are decorated with our show posters by artist Brian Cook and an improv community board featuring information about upcoming events, classes, workshops, shows, and more by Sea Tea Improv and other area improv and sketch groups. This 373 sq. ft. room is available to rent. Beyond the curtain from the Studio Room’s stage wall is our backstage lounge area known as the Tea Room. This 151 sq. ft. room features several chairs and couches, a media area for research and recreation, snacks and a mini-fridge stocked with beverages available for a suggested donation of $1 each, and our comedy library (books & DVDs for loan to our students & improv community members). From the Tea Room, a door leads to our smaller studio room, the Vlad Room, named for Vlad Perez who spent a lot of time in there making that room part of Sea Tea Improv Studios before moving to Los Angeles. This 153 sq. ft. room is also available to rent, and features a folding table for collaborative writing sessions, and soundproofing panels for rehearsal. Across the hall from the elevator is our 501 Studio, a second large studio room equipped with a table, a few dozen white folding chairs, and a mirrored wall. This carpeted room is our biggest single space. This 376 sq. ft. studio room is available to rent. Three smaller rooms (502, 502 1/2, and 503) are adjacent to 501. Between our main Studio 500 and Studio 501 is our small office, the Captains’ Quarters. Here, Sea Tea Improv tends to our business of creating opportunities for comedy in and around Hartford.